This week’s trip was one I had been planning on and looking forward to for a long time. Last summer I made a single trip over to the Cabinet Mountain’s Wilderness in Western Montana, to visit an incredible place called Granite Lake. Instantly awestruck by the CMW, I knew I had to explore it even more. 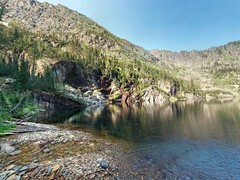 Granite Lake sits below the rugged 4,000 foot vertical face of the mountain “A” Peak. Right next to A Peak is Snowshoe Peak, the highest mountain in the Cabinet Range. At the time, Snowshoe caught my eye and presented a challenge I couldn’t let go of. 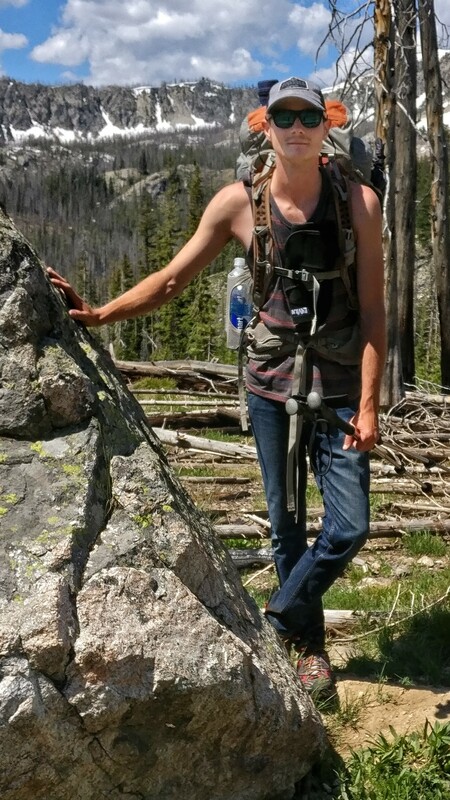 So, I planned to summit Snowshoe Peak because I am a man and men must stand on mountains. When I presented the idea to my fellow trail crew member Justin, he agreed that it sounded like fun and we set off East Friday morning. First stop, Booze ‘n Bait in Troy, Montana to pick up a fishing license. After one stop shopping for liquor, guns, and fishing supplies, we were on our way South towards the trailhead. The trail begins at what used to be a road that led to the trailhead. Water has since washed out parts of the road and therefore you must now hike the 2 miles extra. This makes for a 7 mile hike to Snowshoe Lake with an elevation gain of 3,823 feet. The first 4 miles are fairly well-maintained trail that follows a creek through damp-cool forests and hot-open berry patches. During my online research before the trip, I had read that the final 3 miles were what was called a “manway”. Not really knowing what this meant, I shrugged it off as probably a trail that was a bit rugged. The “manway” was not a trail. We now know that “manway” basically means that no official trail was ever really built and therefore a faint path through the brush is visible from others who have bushwhacked through. These 3 miles included incredibly thick brush, dozens of downed trees, hidden tripping hazards, super-steep slopes, washed-out ground, a bee-sting, and a final climb up an exposed rock-face. After a short hike up from the top of the rock-face, we arrived at the Lake and came across 2 big horn sheep taking a drink. They watched us for a few seconds and returned to the upper rocks, leaving us to find a campsite. Snowshoe Lake sits on a shelf above a valley at 6,143 feet, with Snowshoe peak at 8,738 feet to it’s Southeast. We found our campsite right next the lake’s inlet, which comes directly from the melting snow at the base of Snowshoe peak. The mosquitoes were thick and we set up our tents without rainflys, hoping to catch the stars on the clear night. At 10:30 pm, I awoke to the pitter-patter of raindrops on my tent and arose quickly to throw on the rainfly, as did Justin. The next morning we started off toward the summit around 8:30 am. I read online that the 2,595 feet of gain to the peak was somewhere around 3 to 3.5 miles. Leaving the lake, we climbed a hill and found ourselves in a wilderness wonderland. This high-elevation basin above the lake was a paradise of green-grassy meadows, littered with boulders the size of houses. A half dozen small streams from the melting snow above converged there to create the raging creek that feeds the lake. Islands of lush wildflowers of almost every color were broken up by veins of rocks of all varying sizes. And it all gently slopes higher and higher until it turns to nothing but stone and rises to the top of Snowshoe peak. 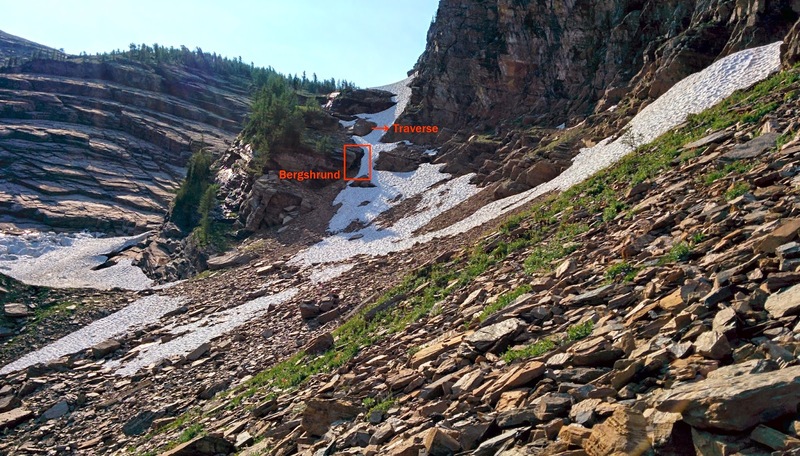 The route I had researched led us up to the Snowshoe Peak ridgeline via a narrow chute bordered by cliffs. Unfortunately, this chute was still holding a massive piece of snow. Feeling like we could get around it, we started the climb up the loose talus slope. We decided we could climb the cliffs to the left of the chute, if we could just get up and over the first high cliff. To do this we either had to A.) traverse the steep snow chute from the right side without ice axe or crampons, or B.) claw our way up the bergshrund, which is the location where the snow pulls away from the rock wall. We chose B, which also included a small waterfall flowing over the top of the crack, directly where we needed to go up. The steep ascent to the head of the crack was made even scarier with the water that soaked the rocks, however I managed to climb part way up and find a hand-hold to pull myself up and over. As Justin came up, he was unable to reach the hand hold I had used and so I held out my trekking pole for him to grab and pulled him up as well. Soaked and relieved, we continued up the large wet slabs of rock toward the ridge above us. Upon reaching the ridge, we were greeted with magnificent views in all directions, including a good look at the rest of our trek toward the top. The ridgeline provided a fairly non-technical but sometimes steep hike to the summit, which we reached around 11:00 am. On the summit, we were greeted with 360 degree views of the wilderness area. Mountain tops in every direction towered above lakes 4,000 feet below. There was a lot of air on the peak because of the way all the sides seem to just drop right off into nothing but scenery. A menacing front of clouds loomed to West and we heard thunder, so after only a short time on top, we decided to get back down to the much-less exposed lake. When we reached the dreaded area where we climbed up through the crack, neither of us wanted drop down it backwards. Looking for another way, we decided our only option was to traverse the snow chute and hike out in the bergshrund on the right side of the chute. Without ice axes or crampons, a slip and fall would mean a very long, fast slide to the rocks below. But, we took it slow, kicking in solid footholds in the solid snow and ensuring our trekking poles were firmly planted with each step. I’d love to say that as a man I had no fear, but that was honestly some scary $#!*. By the time we got down, the storm had moved in above us. Fortunately, it brought only light rain in-between periods of hot sunshine. So, I grabbed my fishing pole and quickly began reeling in the cutthroat trout. A couple of hours later and I caught 6 fish however only the first one was worth keeping. That night, we ate the very delicious fish in front of a campfire and watched the lightning storms in the distance. Light rain once again broke into sunny skies for the morning and we hiked out the “manway” to the actual trail. A trail to this lake does not exist and therefore this is an advanced trip. The remote location, rugged terrain, and lack of access ensure that solitude can be found at Snowshoe Lake, making this wild place feel even more wild. 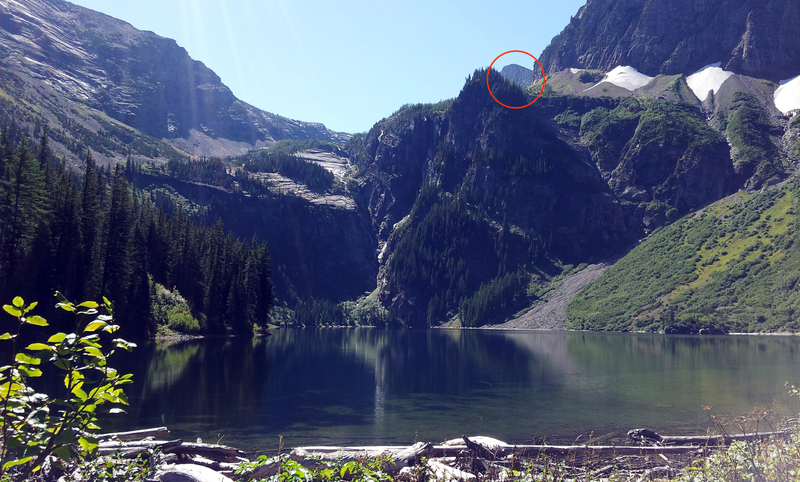 I’m not sure why the Forest Service never completed a trail to the lake, however it keeps all but the most-determined from reaching it, ensuring that it stays natural.